Mead is no longer a drink delegated to the pages of history. A handful of local companies already make the honey-fermented beverage, and a new meadery coming to Castle Rock hopes to win the drink a few more fans. Honnibrook Craft Meadery will open its tasting room at 2276 Manatt Court on Feb. 16. Fagan and co-owner DJ Kurtz are longtime home brewers who began making mead only a few years ago, according to Fagan. 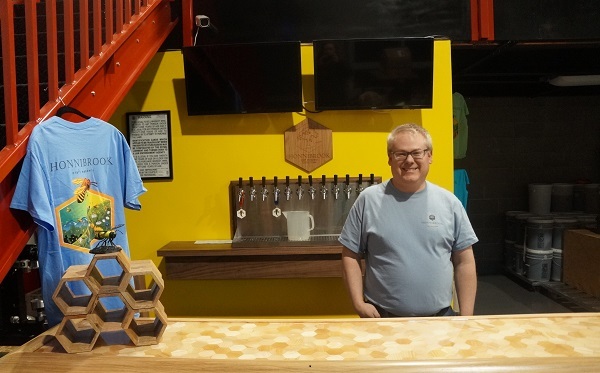 They began plans to open a brewery around 2015, but quickly pivoted to the idea of making mead. But Fagan and Kurtz don’t make mead the traditional way. According to Fagan, because mead is honey-based, it’s not easy to ferment it dry. So mead is sweeter than wine — sometimes too sweet, Fagan said. So the pair makes what they call “draft mead,” which has lower alcohol content — around 6.2 percent — and is less sweet than traditional mead. 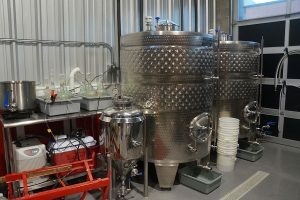 “It’s similar to a brewing process — we actually use brewer’s yeast,” Hagan said. The meadery is stocked with three 2,000-liter white wine tanks and a 15-barrel brewing tank. To make the mead, Fagan puts water, 50 gallons of honey, and the brewer’s yeast in a wine tank, where it sits for about three weeks. Two of the meadery’s three 2,000-liter white wine tanks. Then they filter out the yeast — Fagan said it won’t drop out itself like it does in beer. The mead then is moved to the brewing tank, which further filters the drink and adds some carbonation. After a few days, they keg it. Other predicted favorites are Honnibrook’s salted mango mead called “Blushing Yeti” or its mint-lime mead called “Mojo,” which tastes just like a mojito, Fagan said. Fagan and Kurtz are also making full-strength mead with more honey, but in much smaller batches. Because of this, the pair decided to price their mead similarly to the cost of a craft beer. They’ll sell a four-ounce taster for $2, a 12-ounce glass for $6 and a 750-milliliter “crowler” for $10. Honnibrook sources most of its honey from Colorado, Fagan said. Its main honey suppliers are Lockhart Honey Farms in Colorado Springs and Clark’s Honey Farm in Fort Lupton. In addition to main-floor seating, the pair installed a large mezzanine inside the 1,800-square-foot space for private parties. They plan to serve their mead mostly out of their Castle Rock tasting room, but also will start distributing locally. Fagan said he even trademarked the name “Honnibrook,” which is the Scandinavian word for honey, in case they ever decide to go national. Fagan and Kurtz bootstrapped the entire operation, Fagan said. Records show Fagan, acting as Arcus Research Inc., purchased the unit that houses Honnibrook — B9 — in 2017 for just over $234,000. But Fagan and Kurtz hope to change that. Fagan said there are quite a few mead-makers in Colorado, but that most do it on a hobby level. And if they do distribute, it’s on a small scale. The tasting side of Honnibrook Craft Meadery. 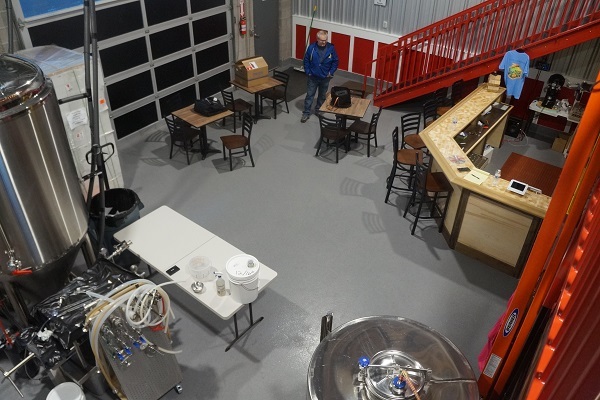 Meaderies with tasting rooms are also rare, but Honnibrook won’t be alone in that category. Queen Bee Brews opened in 2016 north of Denver, and opens its doors to tasters on weekends. Redstone Meadery in Boulder opened in 2001 and distributes nationally, and opens its tasting room six days a week. Black Forest Meadery in Colorado Springs, Meadery of the Rockies in Palisade and Randy Buzz Meadery in Golden also operate tasting rooms. But Honnibrook will be the only meadery in Castle Rock. After it opens, it will be open weekends from noon to 6 p.m., because Fagan and Kurtz still work day jobs — Fagan in IT and Kurtz as a truck driver. Fagan said if all goes according to plan, they both will make the meadery their full-time job. Before that, though, they may hire employees to open during the week. Ultimately, they want the spot to be a place where people can gather, learn and imbibe, Fagan said. Another recent addition to the Castle Rock beverage scene is Wild Blue Yonder Brewing, a brewpub that opened at 519 Wilcox St. in late 2018. 1 Comment on "Castle Rock is getting a meadery"
I think you meant ‘relegated’ right?